He is running a country that contains 10 provinces and 3 territories and is considered to be the second largest county in the world based on total area. The peaceful border Canada shares with the United States is said to be the world’s longest land border. I ran his chart for December 25, 1971 at 9:27 PM EST (UTC -5.0) in Ottawa, Ontario, Canada (45n25, 75w42) in Goravani software using settings similar to AstroVed’s (Calc Type = Full, Moon from Earth’s = Center, Nodes = Mean). The source for Justin Trudeau’s birth data comes from AstroDataBank which rates the reliability of the data as AA (an excellent rating) with the source being his birth certificate/birth record. The Zodiac sign coming up on the eastern horizon (sometimes called Ascendant [AC] or Lagna or Rising Sign) at the moment of his birth was Leo, a sign of royalty consciousness and power, backdrop for his character and personality. The symbol for Leo is the lion, an animal often called “king of beasts.” This Ascendant helps support him for being comfortable taking authority and with working in a powerful position in government and enjoying politics. He was born into a famous Canadian political family as the son of Margaret and Pierre Trudeau (a former Prime Minister of Canada). The planet that rules Leo, his 1st house of self, is the Sun, the powerful star that our solar system is named after. The Sun is placed in his positive 5th house of God, creativity, projects and children. The 5th house is also sometimes called the “house of intelligence.” The illumination and intelligence of the Sun helps him be wise in his relationship to power. Trudeau was born in the Tithi or Moon phase of 9th Waxing, a time element favorable for blessings of the divine and also associated with the Goddess Saraswati, an archetype of education, arts/sciences and higher wisdom. Dr. Pillai, founder of AstroVed, has spoken many times about an ancient story told by the enlightened sage Vasistha about Queen Lila and the amazing teachings she received from the Goddess Saraswati (see Pillai Center’s On Demand Video: Story of Lila). Trudeau’s Moon has helped him receive benefits of higher education as he has degrees in literature and engineering. Earlier in life, he taught French and Maths for a living. His Moon is in the star or Nakshatra of Revati. This Birthstar can give blessings for enlightenment and relationship as well as wealth. It is associated with the power of nourishment. Revati is ruled by Pushan, an archetype who takes care of the cows of the gods, and often people with Moon in Revati will have pets. In 2016, Trudeau sent out a tweet with a picture of his two year old son Hadrien playing with their new puppy, Kenzie, a female Portuguese water dog. Interestingly, Trudeau’s Moon is in Pisces, a female water sign. The Moon rules mind and emotions, and energies of Revati are said help a person be social, charming and polite, all qualities quite useful for a leader and politician. While some stars are said to be fierce or hot, Revati is one of the stars described as gentle, soft, mild and tender. His birthstar aids him in having an altruistic focus. As Prime Minister, Trudeau personally welcomed Syrian refugees arriving in Canada and was photographed handing out winter coats as a practical gesture. In May, 2016, Trudeau visited Fort McMurray, site of an intense wildfire in the province of Alberta. He commented that first responders, “Detailed just how many interventions were made, at various points — strategic moments that ended up saving neighbhourhoods, and indeed large portions of the community.” He assured the community, “Canadians are standing with you.” His Moon in Revati helps it be natural for him to be willing to extend a helping hand. Trudeau has eight planets in feminine signs and one planet in a masculine sign. The large number of planets in feminine sign placements may give him more receptivity to others, more trust in his intuition and more willingness to apply softer skills in his leadership. He has five planets in water signs, and in addition to that, those five planets are spread out across all three of the water signs: Cancer, Scorpio and Pisces. Since Trudeau has the majority of his planets based in water element signs, his sensitivity and empathy will be heightened. He will have genuine motivation to work as a healing force and to bring people together. He has three planets in stars ruled by Mercury as his Moon is in Revati and his Mercury and Jupiter are in Jyestha. This gives him some additional blessings from Mercury, planet of communication (useful for any politician) and also planet of mathematics, numbers and computers (important skills in modern day technology). Once Trudeau astonished a reporter, who questioned his technical knowledge, by accurately describing the physics behind quantum computing. Trudeau explained to the reporter, “Normal computers work, either there’s power going through a wire or not, it’s one or a zero. They’re binary systems. What quantum systems allow for is much more complex information to be encoded into a single bit. A regular computer bit is either a one or zero, on or off. A quantum state could be much more complex than that because as we know things can be both particles and waves at the same time, and the uncertainty around quantum states allows us to encode more information into a much smaller computer. That’s what’s exciting about quantum computing.” The elegance and clarity of this summary displays support from Mercury. He has three planets in signs ruled by Jupiter with Moon and Mars in Pisces and Sun in Sagittarius. This means his soul (Sun), mind/emotions (Moon) and willingness to take action (Mars) all have a strong grounding in the benevolent and ethical influence of Jupiter. His sense of integrity can be expected to be a guiding principle for him during his time of service. 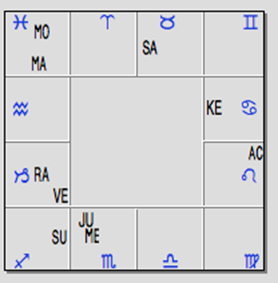 In his chart, Jupiter sits in Scorpio, a sign ruled by Mars, while his Mars sits in Pisces, a sign ruled by Jupiter. When two planets have an “exchange of rulerships” like this, they each give additional support to each other’s agenda. It is known as Parivartana Yoga or mutual reception. In this particular instance, both planets are also ruling water signs and sitting in water signs. This dynamic of water sign rulership exchange further deepens the fluidity of water element influence on Trudeau’s character. Trudeau has a second Parivartana Yoga in that Saturn sits in Taurus, a sign ruled by Venus, while his Venus sits in Capricorn, a sign ruled by Saturn. While it is estimated that perhaps 40% of the general population has one Parivartana Yoga in their birthchart, it is thought that less than 5% has two. Saturn sits in Trudeau’s 10th house of career and is having exchange of rulership with Venus sitting in his 6th house of service. Saturn’s influence could give longevity to his service while Venus can continue to enkindle his passion for public duties. The presence of Rahu, planet of new ideas, in his 6th house of service gives support to Trudeau’s willingness to innovate in areas of public policy. Trudeau has embraced the United Nations Declaration on the Rights of Indigenous Peoples (UNDRIP), and his government is said to be seriously examining the North West Territories’ (NWT’s) collaborative consent approach to nation-to-nation relationship with indigenous peoples as part of UNDRIP implementation. Trudeau has proclaimed, “We should be working together from the very beginning.” In addition, he has stressed his commitment for justice for disappeared indigenous women. Both Mars (courage) and Moon (fluidity) sit in his 8th house of transformation and change in the transcendental sign of Pisces, so he will continue to feel impulse to address larger concerns with some of the attitude of a dreamer. Valli is available for ½ hour and 1 hour Live Astrologer Consultations (LAC) at AstroVed (USD global version only). She encourages people to create a free account at AstroVed and run free reports about their own Birthchart, Birthstar, Moon sign, and Planetary Influences. This is a simple way to begin to make friends with astrology. Reminder: All the planets like it when we help others in need. Please consider making a donation to Dr. Pillai’s non-profit charity Tripura Foundation.